bwpcareers.com is a virtual, private staffing firm located in Atlanta, GA. and has been successfully been in business worldwide since 2006. For more information about working as a Virtual Recruiter with our team at bwpcareers.com where you can average $1,800-$3,000 per week please visit our website at www.bwpcareers.com and follow the instructions. See you there! The incredible benefits that await you if you're awarded a contract to begin working as a Virtual Recruiter with our team at bwpcareers.com are simple and straightforward. Immediately average $1,800-$3,000 per week. Be able to enjoy the financial future you've always imagined for yourself. Get started in an extremely lucrative trade with little or no experience. One-on-one training and support is provided around the clock 7 days a week. Work at your own pace from your own home or virtual office. Work with an established staffing firm that's been in business worldwide since 2006. Contract available every year for returning recruiters. Easy onboarding process that allows you the opportunity to get started working and making money within days of discovery. Completely virtual and paperless environment which means you can work with us from anywhere in the world with access to the internet and a phone. We work hard at bwpcareers.com to provide you with the springboard you need to leap ahead in your career and build a financial cushion that gives you all the confidence you need to take the risks you've always wanted to take to really get where you want to go in your professional career but couldn't because you couldn't afford to take those risks! Well now you can! Imagine your financial situation now and then imagine it after you add $2,000-$3,000 per week in to the mix! This is a fact, I own this company and am proud of the fact that I get to be myself and tell you all the exact truth because I'm not forced by some shady boss to tell you all what he or she thinks you want to hear. I create the standards and one of my favorite standards is to be completely honest and transparent. So when I tell you that the top third of our team of Virtual Recruiters averages $4,000-$5,000 per week you better believe it. An opportunity to work with bwpcareers.com is one of staffing and recruitings best kept secrets. Get started today only at: www.bwpcareers.com. 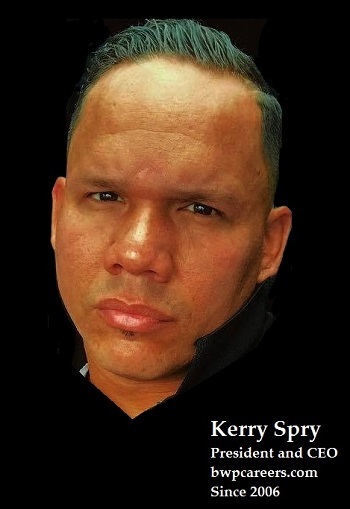 My name is Kerry Spry. I'm the president and CEO at bwpcareers.com. We are a private staffing firm located in Atlanta, GA. and have been in business successfully since 2006 on a global scale and we are experts on every level of staffing and recruiting. Our mission is simple and clear. Work hard. Be honest and transparent. And don't slow down until the job is done. And repeat. As a recruiting company our virtual recruiters come from different parts of the world and many different areas of experience. Most of them have never worked as an Independent Contract Recruiter before coming to work at bwpcareers.com but all of them realize immediate success and enjoy high levels of income here with us at bwpcareers.com. ​All of our ads that I place or our recruiters place on behalf of our client will always have clear and easy to follow instructions as well as a name and number to call because I know how uncomfortable the search for a new path can be. And I am available anytime for support and clarity. My goal is to always provide job seekers with a number to call a real live person to talk to should you ever feel that something isn't right. I've been at the same address and phone number since 2006. Call me if you need me. Thank you for taking a second to read my version of a "mission statement".